(TibetanReview.net, Jan20’19) – Tibet activists have joined a coalition of other rights campaigners on the Internet Freedom Day of Jan 18 to call on Google to cease its development of Dragonfly with protests held in the US, UK, Canada, India, Mexico, Chile, Argentina, Sweden, Switzerland, and Denmark. Google designed the Chinese search engine, code-named Dragonfly, to blacklist information about human rights, democracy, religion, and peaceful protest, in accordance with strict rules on censorship in China that are enforced by the country’s authoritarian Communist Party government. Demonstrations were held before Google headquarters in those countries, seeking reassurance from the company that it would not revive the controversial project which has also led to strife within the internet giant. These included the resignation of prominent Google engineer Liz Fong-Jones after 11 years of working for the company and protest on Jan 15 by a group of 49 investors said to represent some $700 billion in assets, noted theintercept.com Jan 19. In Nov 2018, for example, a hundred Google employees signed a public letter condemning the company’s failure to cancel Project Dragonfly altogether, noted theregister.co.uk Jan 18. Earlier, in Dec 2018, an internal dispute had forced Google to shut down a data analysis system that it was using to develop the search engine. This “effectively ended” the project because the company’s engineers no longer had the tools they needed to build it. However, the company’s CEO Sundar Pichai has refused to rule out launching the search engine sometime in the future while insisting that there were no current plans to do so. He said at the time that “once the furore dies down” Google will be launching a censored version of its display advertising server search engine in China, said the theregister.co.uk report. 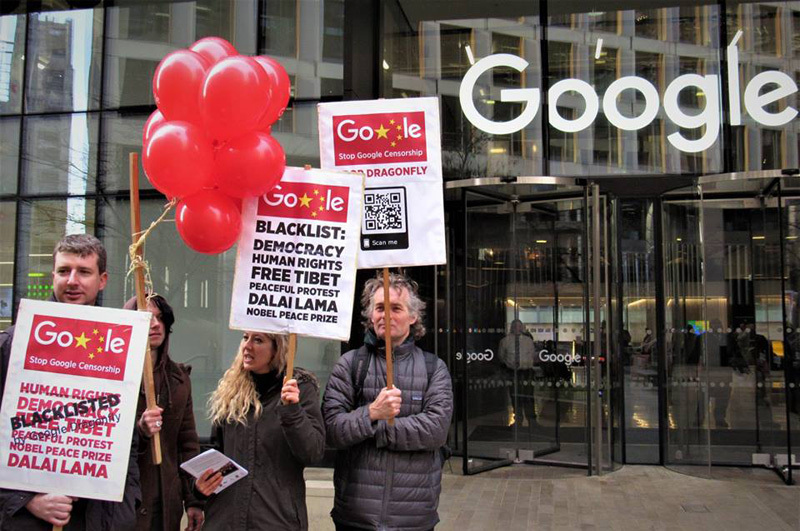 Google “should be connecting the world through the sharing of information, not facilitating human rights abuses by a repressive government determined to crush all forms of peaceful online dissent,” Gloria Montgomery, director at Tibet Society UK, has said. Pichai’s lack of response only heightened their concerns. The report noted that Google had faced protests over Dragonfly from all corners – Human rights groups, US senators from both the major political parties, Vice President Mike Pence, and the company’s own employees and shareholders, forming an unlikely alliance in opposition to the plan.